During every long journey there are moments of looking back, of breathing in the vast traveled landscape as an inspiration to tighten the straps and press onward. After shaping a singular career out of evocative assemblages from a trove of songbooks—plucking everything from Irish reels to shape-note hymns to Top 40 pop—Sam Amidon uses Bright Sunny South as an opportunity to sit with a talented core of players and contemplate the distance he’s covered. This homeward glance might seem a redundancy, given how fully roots and genealogies of song already inform Amidon’s craft, but Bright Sunny South continues Amidon’s commitment to turn passed-down traditions into a progressive, knowing form of music. Amidon doesn’t fetishize history or fiddle with gritty cultural tropes—there are no jelly jars of moonshine, no broke-down cars on his lawn—and rather than attempt to recapture the anachronistic minimalism of his first album, But This Chicken Proved Falsehearted, Amidon relocates his earliest influences and approaches those crossroads with all the maturity and mastery he’s gained as a working artist. Bright Sunny South’s lead and title track establishes the reflective mood, with Amidon stepping out of a soft organ haze to offer the lonesome, Civil War ballad of a young soldier making mental farewell to his family as he marches off to battle. Songs of war, songs of wandering, songs of devotion—Amidon delivers each of these unfolding narratives with a footsore melancholy, viewing his native country from an ex-pat’s remove. 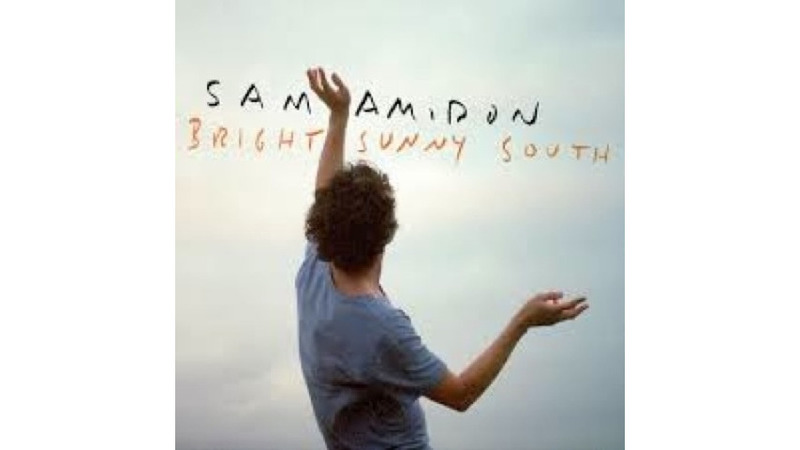 Recorded in London—where the Vermont-raised Amidon now makes a home with wife Beth Orton—the precisely articulated production of Bright Sunny South marks a notable shift from the atmospheric soundscapes of his previous albums, All Is Well and I See The Sign, both of which Amidon created in league with the Icelandic record label/collective Bedroom Community. No longer fumbling through novice flubs, Bright Sunny South features the most accomplished musicianship of Amidon’s career. Throughout, there are intricately picked acoustic guitars, bayonet stabs of fiddle and cool jazz percussion, the instruments traded back and forth by a spot-on group of players that included Bartlett and multi-instrumentalists Shahzad Ismaily and Chris Vatalaro. The plaintive, fleeting “I Wish I Wish” immediately joins “Saro” among the loveliest tracks in Amidon’s canon, the vocal line strolling through delicately blooming piano, loose-swinging cymbal and 83-year-old trumpeter Kenny Wheeler’s From Here To Eternity horn. Wheeler’s sunset brass also elevates “He’s Taken My Feet,” a Psalm of Thanksgiving and praise proffered by one who found deliverance out of “the mire and the clay.” From its simple beginnings, the prayer descends into a chaos of roiling drums and dissonant guitars, a pattern that powerfully reiterates the uncertain cacophony of “True Born Sons Of Levi” from But This Chicken Proved Falsehearted. Further mirroring that album, where Chicken’s bluegrass holler “Rocky Island” began with a muffled laugh, plying trashcan percussion and a “here goes nothing” attitude, on Bright Sunny South Amidon molds the Celtic rambling of “As I Roved Out” into a ripping, Ralph Stanley breakdown, his strident, Appalachian bark augmented by portentous banjo and a polyrhythmic hand-jive. Compared to the rest of Bright Sunny South, the bluegrass growl of “As I Roved Out” stands as an outlier—as with past recordings, Amidon delivers the bulk of his vocals in an idiosyncratic, almost a cappella style, sounding as if he’s respectfully removed his hat and is still clutching the brim while he lingers over odd syllables and pushes beyond each strain and break in his voice. The instrumental mix on Bright Sunny South mirrors this unattached mode, compiling discrete elements in the same manner that Amidon casts disparate histories within a single song. Considering the record’s professional, post-Fahey blend of jazz-folk and the audiophile clarity of the engineering—particularly the finely enunciated tones of nylon and steel—Bright Sunny South calls to mind the work of another Windham County, Vt. local, hitting many of the same moody, intertwining notes as Will Ackerman’s Passage. Although that’s not exactly the coolest touchstone, like Alex de Grassi, Michael Hedges and other original Windham Hill artists, Amidon’s chamber interpretations are pitched more for the symphony hall than the back porch. Less successful, though, is Amidon’s version of Mariah Carey’s “Shake It Off.” Here, the singer fails to account for how the musical landscape has evolved as well, and the dead sober, voice-and-piano take on rap and diva turns has become its own tiresome cliché. With the original lyric taking its emotional cues from a “Calgon commercial,” there’s little hidden depth to mine, leaving Amidon no course but to slow the tempo and cut the thing short. The misstep of “Shake It Off” becomes more glaring as the backside of Bright Sunny South begins to flag, an inertia underscored by a downcast performance of “Streets Of Derry,” a traditional Irish number recently brought to aching, poignant heights by Cara Dillon and Paul Brady. So, the time comes for Amidon to rise back to his feet—which he does, with a conflicted and compelling version of “Weeping Mary,” a Sacred Harp hymn that Amidon’s parents recorded on a mid-’70s album for Nonesuch Records, the very label Amidon finds himself on now. After this final sustaining look back, the road ahead beckons.